Mr. Michael Wheeler, professor at Harvard Business School and author of the Art of Negotiation, is on the show. 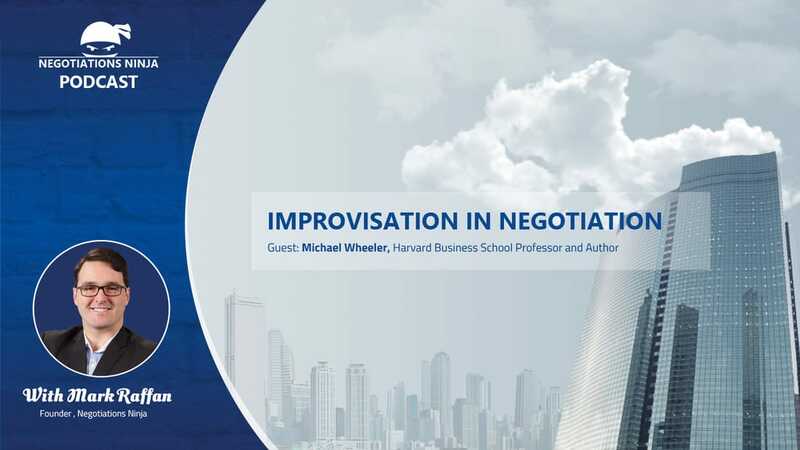 Mike’s book dives into a topic that most people don’t talk about and that’s the role of improvisation in negotiations. We get into how to improvise and what you need to do to ensure you’re light on your feet so you can react when you need to. Mike and I also get into a discussion about AAR’s or After Action Reviews and doing deep dives into your negotiation after the fact to see what you did well, what didn’t go well and what can be improved for next time. Mike’s even developed a cool little app called the Negotiation 360 app (available on Google Play and the App Store) that allows you to rank and rate your negotiation and take notes on it so you can track your progress on skill set from one negotiation to the next. Negotiation 360 – Available on App Store and Google Play.